Could tiny houses help solve Philly’s big homelessness problem? 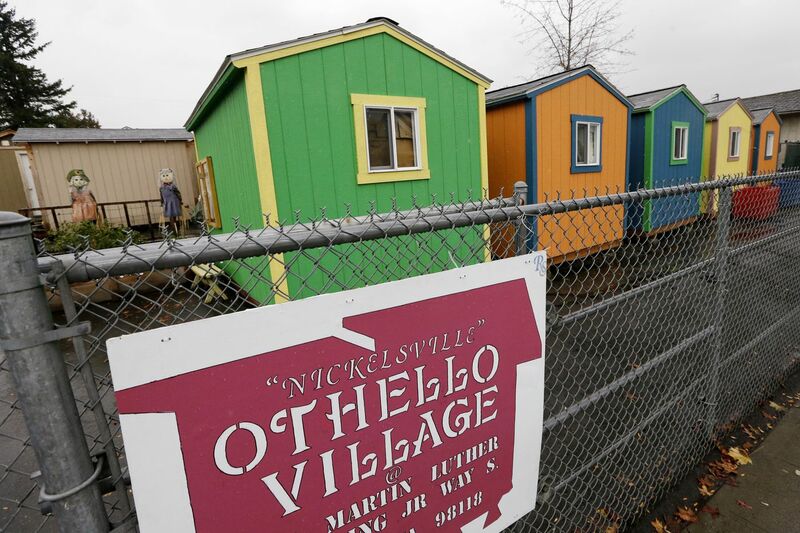 Some of the tiny homes to house people who are homeless at Othello Village in Seattle. A proposal in Philadelphia would involve a village of tiny homes almost twice the size, in Frankford. On any given night, close to 1,000 people in Philadelphia sleep outside, on sidewalks, on benches, and in tents. Shelters fill to capacity, and the places that can take people in often require couples to separate and pets to be left behind. Stephanie Sena thinks that to solve a very big problem, the city needs to think small: like 350-square feet-small. Who’s your rent money going to? Philly bill would unmask LLCs. Sena, a Villanova University adjunct professor who founded the Student-Run Emergency Housing Unit of Philadelphia (SREHUP), wants to build a village of tiny houses to help the city’s homeless. The small-home idea, well underway in a half-dozen U.S. cities and Edinburgh, Scotland, has the backing of City Councilmen Allan Domb, who says he’ll fund the first one, and Mark Squilla, who said he’d welcome a village in his district. The concept of housing people in tiny homes — sometimes no bigger than a bedroom — has been criticized by those who see the structures as undignified. In Philadelphia, Sena said, she’s also encountered pushback from neighbors wary of having formerly homeless people living in their community and those who’d rather revitalize vacant housing than build something new. The idea evolved from Sena’s desire to open a pet-friendly homeless shelter. Now she envisions a community village of 30 to 40 tiny houses on a now-vacant lot at 3809 Frankford Ave. to serve as emergency housing. The houses would be between 300 and 650 square feet, with electricity and plumbing. They would cost between $50,000 and $70,000 to build, she said, estimating that the first 10 and a community center could go up for as low as $500,000. The community center would have social workers to help people move to permanent housing outside of the village. Eventually, she’d like to build a second set of tiny homes available to rent at very low cost. In March, a first tiny home will go up at 2147 E. Orleans St., paid for with a $75,000 no-interest loan by Domb. It’s meant to be a model to spark further investment, Domb said. He got behind the idea after seeing the high cost of building just one affordable housing unit. “Our viewpoint was, if the city’s going to spend $418,000 on affordable housing — and I put that affordable in quotes — why should we not be building five or six tiny homes for the same value? It just makes economic sense,” Domb said. Sister Mary Scullion, who heads Project HOME, said she’s for any organization that wants to contribute to ending homelessness. The key, Scullion said, will be in the bones of the homes. Will they be cozy cottages with some of the style and clever functional attributes people ogle over on HGTV, or will they look more like wooden tents? “The key words are safe, decent, and affordable,” Scullion said. “If Stephanie and her group can do that, I welcome it. I think it’s awesome." Seattle’s taxpayers will spend $4.5 million to fund nine tiny house villages next year. King County, where Seattle is located, counted 6,300 people living unsheltered on the streets this year. That’s more than six times Philadelphia’s count of 987. The Seattle homes started in 2015 as an alternative to tents, and have evolved to insulated, heated, 120-square-foot rooms with locking windows and doors. Today, about 325 people live in the villages, spread around the city, across industrial areas and residential neighborhoods. A photo of tiny houses in Seattle taken by Liz Hersh, director of Philadelphia's Office of Homeless Services, who visited in October. The villages provide communal showers, laundry and kitchen space, and case managers to help residents find more permanent housing. People stay from two weeks to a year, said Sharon Lee, who heads the nonprofit Low Income Housing Institute, which manages some of the villages. The organization encourages nonprofits, churches, and civic groups to donate money and labor to build homes, which cost $2,500 each and can last as long as 15 years, Lee said. Just three years in, it’s difficult to tell if tiny houses move more people into permanent housing than traditional shelters. According to the City of Seattle, about 20 percent to 30 percent of tiny-home residents move to permanent housing. “It’s more or less similar to other emergency shelters,” said Will Lemke, a city spokesman. The number of people in shelters is far larger than that of those in the homes, though, so it’s difficult to compare the two. There have been some hiccups. A village that housed homeless men and women with substance abuse problems and allowed drug and alcohol use will close in March following a slew of complaints in the neighborhood. Lemke said the homes would be repurposed. Elsewhere across the country, tiny homes are sprouting in backyards. Boston, Portland, and Los Angeles all have programs to encourage residents to build tiny residences for the homeless on their property. Austin is exploring 3D printed houses. In Philadelphia, the idea of tiny homes has been floated before. Liz Hersh, director of the city’s Office of Homeless Services, said she visited Seattle in October to look at its efforts. She no longer thinks of the concept as somewhat undignified. Her office is looking at 6,500-square-foot lots around the city for a village. Hersh noted that as with all affordable housing initiatives, the question for the city and Sena is whether funding and resources will come through. Sena is both an academic who understands the systematic problems related to poverty and someone who tries to solve every individual problem that comes her way. “Some pushback I’ve gotten is, like, who is this girl from the Main Line, this Villanova professor who is not from our neighborhood?" Sena said. “But the thing is, I’m an adjunct who lives in Philadelphia in a one-bedroom apartment with my two children, and often I can’t afford to keep my electric on." Stephanie Sena laughs with Jemond McCrea (left) and Tyrone Minter at her apartment in Bella Vista. Sena is planning an affordable housing development of tiny homes. She has helped McCrea and Minter transition out of homelessness. On Monday, Sena zigzagged across her cramped kitchen, working pots and pans on her stove in anticipation of four dinner guests, all formerly homeless people whom her shelter has helped. For Sena, a tiny-houses village would be a bigger version of this small dinner gathering, a way to give people resources and connections to one another in a way not always fostered across cots at shelters. Over pizza and matzo ball soup, the four guests talked about how homelessness had sneaked up on them and the domino effect it had. They shared stories of jobs lost, and lamented how expensive it is to be poor. Each person’s story was a study in how rapidly one can go from stable to out in the cold. Corey and Alisha Robinson, both 36, talked about being evicted from their home in Mayfair after Corey lost his job and they fell behind on rent. They lived with relatives for a while, but then things got tense and they started to feel like a burden. The couple decided to move out. They didn’t anticipate the trouble they’d encounter finding a shelter that would allow them to stay together, let alone let them bring their long-haired Chihuahua. So they wrapped the puppy up tightly and decided to brave it on their own, spending days riding buses and nights on benches in Jefferson Station. Alisha couldn’t believe how many benches were already occupied. After connecting with Stephanie, they got help paying for an Airbnb. SREHUP is also going to pay their move-in costs once they find an apartment.